I've made this pie this morning, ready to eat later and have some for lunch at work tomorrow. TO START Get all your ingredients and equipment ready. Turn the oven on to 200°C/400°F/gas 6.Put amedium(approx. 26cm diameter) ovenproof frying pan on a medium heat. of 1 lemon and a lug of olive oil. Once the nuts are light golden, add them to the egg mixture and mix well. Put the empty frying pan back on the heat, add a little olive oil and a knob of butter and pile in half of the spinach. Gently push and move it around and add more as it wilts down. Make sure it doesn’t catch on the bottom and when there’s room, start adding the rest, stirring frequently. Meanwhile, take the pastry out of the fridge. Lay a large sheet of greaseproof paper, approximately 50cm long, on the worktop, rub a little olive oil all over it, then scrunch it up and lay it out flat again. Arrange 4 filo pastry sheets in a large rectangle, overlapping at the edges, so they almost cover the paper. Rub some olive oil over them. Sprinkle over a good pinch of salt & pepper and a pinch of cayenne. Repeat until you have 3 layers. Don’t worry about any cracked bits. Remember to keep stirring the spinach. Must admit I was tempted even before I saw your pic! I bet it would work nice with chard too, I've loads of that in the garden at the moment. Om nom nom indeed. Might actually make it tomorrow as I am planning to have the oven on to make a banana loaf and some cookies and some cup cakes. I had a trim waistline when I needed it - nowadays, buggrit, give me the pudding! To get the base cooked, roll it out thinner. Instead of just scoring a square like the above recipe, make 4 cuts right through to make a border about 1.5 cm wide, still attached to the inner square at two diagonally opposite corners. Then fold both borders over to the opposite so it makes a rim, with an attractive "knot" at the two uncut corners. I do that recipe already CH thats why I liked the look of the jamie filo pie, as it was a bit deeper? Ah well, will have a play and see what happens! Ooh, lovely! I love spanakopita! My greek friend's mum used to send hers in the post from Greece sometimes. Gorgeous even when cold and slightly squashed! I think the herb they used was dill though. Worth trying with dill if you've got some - fantastic herb combination with feta cheese (or any cheese really). I use spinach when there are lots but it also works with young kale leaves. I do this with nettles in place of spinach - pretty sure I got the idea off one of the early River Cottage episodes - the one where Hugh entered the nettle eating competition with that chap who used to be on INEBG forum in the early days. I also tend to use walnuts instead of pine nuts, because we have kilos and kilos of the former, while the latter are so hideously expensive (I always make pesto with walnuts for the same reason). 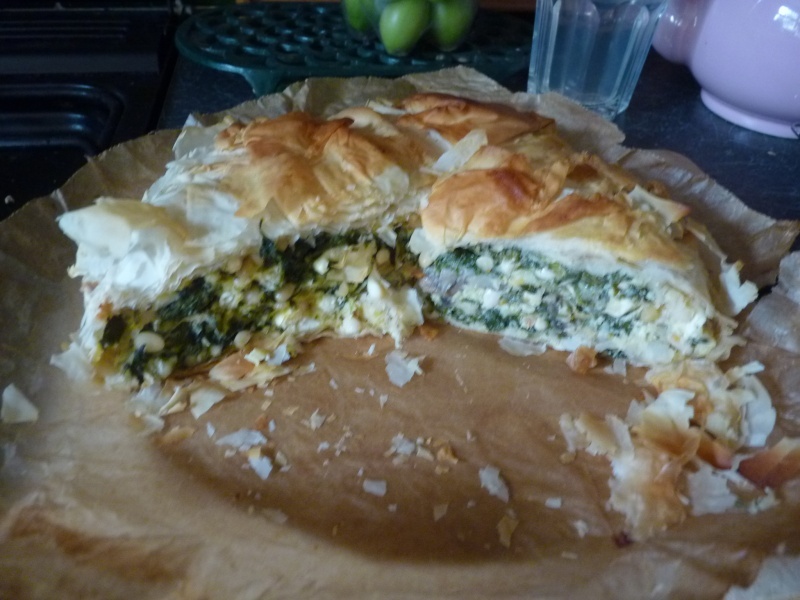 Another yummy recipe with filo is Pastilla, which is essentially similar but using pigeon breasts and icing sugar in place of spinach and cheese.